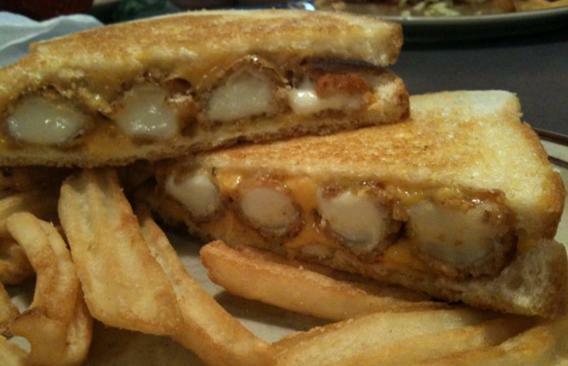 The much anticipated “FRIED CHEESE MELT.” Four fried mozzarella sticks and melted American cheese grilled between two slices of sourdough bread. I was pretty amped up to eat this thing, especially after all the “bad” press it was getting. (See ‘scapegoating-fitness-crazies’ in the Blogroll.) Who would have thought a reject from the kids menu with 4 mozzerella sticks jammed into it would evoke adjectives like “beyond gross,” and “disturbing?” Really, man. Get a grip. The sandwich was good. TREMENDOUSLY salty, though. The bread was pretty unremarkable, and not really appropriately sized. (There was a fair amount of sandwich with literally nothing in it.) Dare I say, it could have used MORE cheese – but I thought the marinara was a nice touch. I gave it a 7/10. Ultimately, I wouldn’t say it lived up to all the hype, but I did find it a pretty nice value at 4 bucks.